1 Rinse cilantro, mint and basil, shake dry, pluck leaves and chop coarsely. 2 Rinse lime leaves, pat dry and cut into fine strips. 3 Squeeze out the lime juice. 4 Rinse fish fillets, pat dry and cut into cubes. Combine the chopped herbs, lime leaves, 3 tablespoons lime juice, 3 tablespoons curry paste and the fish sauce in a blender and puree until smooth. 5 Add the egg, season with salt and pepper and blend again briefly. Place in a bowl. 6 Rinse the beans, drain and cut into slices (about 1/2 cm/approximately 1/4 inch). Stir into the herb puree. With moistened hands, form the mixture into 20 small balls. 7 Brush a steamer basket with the oil. Cook the fish balls in batches over a pot of boiling water until cooked through, 12-15 minutes. Transfer steamed balls to a baking sheet and keep warm in preheated oven at 80°C (fan 60°C, gas mark 1) (approximately 200°F/convection 140°F) while cooking the remaining fish balls. 8 Meanwhile, peel garlic, onion and cucumber and finely chop. Rinse the chile pepper, wipe dry, halve lengthwise, remove seeds and finely chop. 9 In a small bowl, stir together 3 tablespoons lime juice and remaining fish sauce with the rice vinegar and sugar. Mix in chopped chile pepper, onion and cucumber. 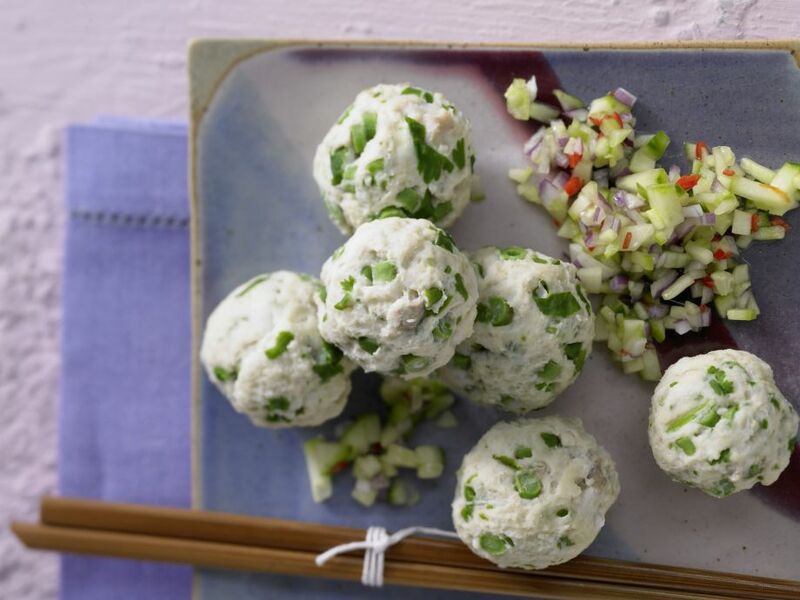 10 Serve fish balls warm with the dipping sauce.